Lurline's Place: Poppies and Pinwheels! It has been two weeks since I chatted - where has time gone? I certainly haven't spent the time sewing! My Danielle brings their big quilts home to launder - this one has been taken over by her DH, Adrian - a good opportunity for you to have a look-see! I have used repro fabrics - yes, still quite clear and bright and quite old, too. It has certainly stood the test of time and I have combined hand and machine quilting and it takes very kindly to a gentle wash in the machine! I have been working on my applique but not a lot of progress there! Now I have the thought of making a quilt in Liberty Lawn - does anyone have any advice or tips please? I also really like Little Folks in voile by Anna Marie Horner and feel I will have to have a little play - I have a Retreat coming up at the end of the month - would be a nice way to spend the time with Girlfriends! in a lovely venue in the country just outside of Perth. Poppies and Pinwheels is just beautiful Lurline. Sure glad we have a chance to view the photos of this gem. I've seen photos and read about voile quilts in blogland, but can't just name where right now. Have fun on your retreat. OMG! It's just gorgeous! I'm so happy you're showing off your quilts. You are so talented, lady! Stupid question time: what exactly is voile? Or lawn? :D Good luck with it! 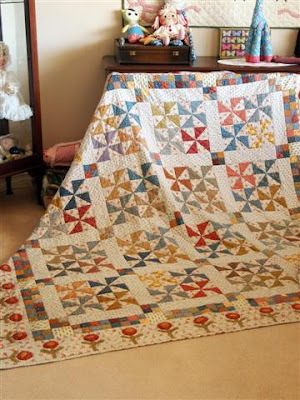 A Liberty lawn quilt sounds wonderful! Love the flower border! So cheerful! What a wonderful quilt and I love everything about it. Quilt washing day is such a nice opportunity to visit and enjoy old quilts. This one is a real beauty. Enjoy your retreat. The getting ready and planning part is such great fun. I will be retreating this weekend! Woohoo!!! What a gorgeous quilt, Lurline!!! Love it!! That's just such a gorgeous quilt!!! Just love the sparkling of the colours!! You said it was rather old? May I ask how old this beauty is? Thanks for showing her to us! Such a pretty quilt. I love the poppy border. It really makes it special. How old is it? I'm speechless (for a change) that is just beautiful ! What a beautiful quilt. Lurline!! What a pretty quilt!! It doesn't look old at all. 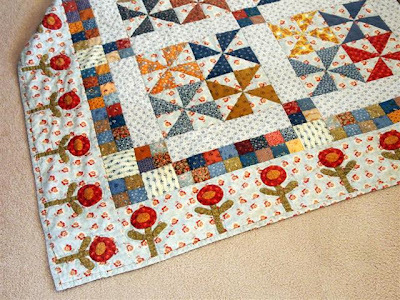 The flower border is perfect for this happy quilt. I love this quilt, Lurline! It hits you as soon as you see it...and lovely fabrics. 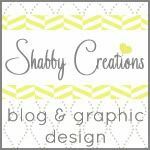 What was the fabric range you used? The colours are so vibrant. I love this quilt, Lurline! The flowers on the border just makes the whole quilt pop. Good quilt. 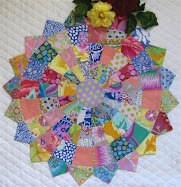 Love the Border on this one..it is just Beautiful..
Love that quilt. The border is such a great idea! That is such a lovely quilt...LOVE the borders! Happy stitching on the applique! Love the way you set this quilt! Dare I start another quilt with 80+ UFOs waiting!? Sure! I really like this quilt, Lurline. Brighter truer colors than the usual 30s repros, so appealing! I have been a tad busy also , so being the 27th to comment all I can add is words fail, can I say a quilt to be admired and a giver of comfort. Lovely quilt and I just love that border! Just beautiful...I love that flower border! Liberties and a Mug Rug!